Honors Stable Corp.’s Wildcat Red, in a hard fought-thriller Saturday, defeated General A Rod by a head in the $415,000 Besilu Stables Fountain of Youth Stakes (G2) at Gulfstream Park in Hallandale, FL. Wildcat Red got out to the lead first through the opening quarter-mile in :23.03, at the half-mile General A Rod was a head in front in :46.25, but Wildcat Red took the lead once more after 6 furlongs in 1:10.13 and held it by a narrow margin the rest of the way, finishing 1 1/16 miles in 1:41.85. Jockey Luis Saez was at the reigns for the Jose Garoffalo-trained Wildcat Red, who earned 50 points on the Road to #KYD14. General A Rod earned 20 points in second and Top Billing was a strong third and also looked like he may have had more in the tank. In fourth was East Hall who earned five points. This marked the fourth career win and second Stakes win for Wildcat Red, who also won the Grade 3 Hutcheson Stakes on Ferbuary 1 going seven furlongs. He is 6-4-2-0 with career earnings of $490,850. 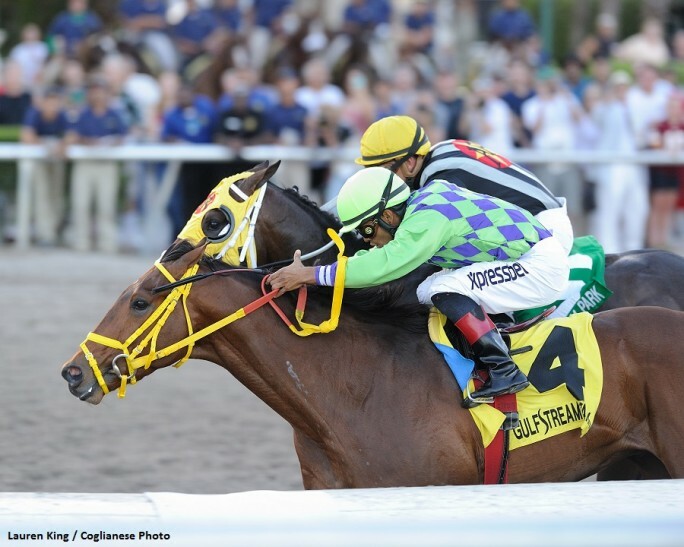 If all things go according to plan, the top two finishers in the Fountain of Youth will race next in the $1 Million Besilu Stables Florida Derby (G1). According to an article by the BloodHorse, Holy Bull Stakes-winner Cairo Prince will also point to the March 29 Derby. 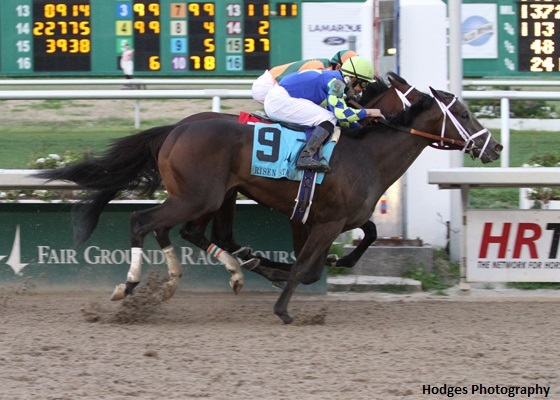 Starlight Racing’s Intense Holiday rallied from three lengths back entering the stretch to edge out Albano by a nose in the $400,000 Risen Star Stakes (G2) at Fair Grounds in New Orleans, Saturday. 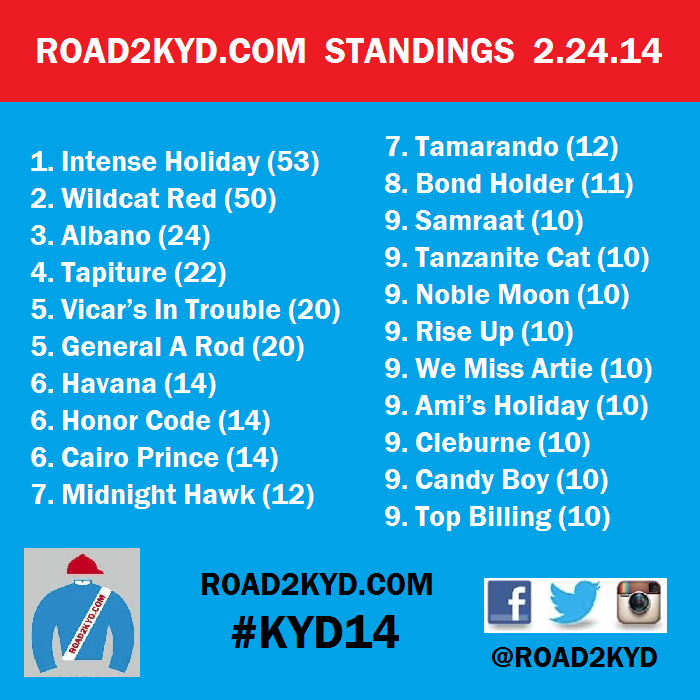 Trained by Todd Pletcher and ridden by Hall of Fame jockey Mike Smith, Intense Holiday earned 50 points along the Road to #KYD14 and is now the overall points leader with 53 total. Albano earned 20 points finishing second and is now third in the standings with 24. Vicar’s In Trouble was third earning 10 points to put his total to 20 overall, and Hoppertunity earned his first five points in a fourth-place effort. Sent off at odds of 5-1, Intense Holiday was never better than seventh-place through the first six furlongs as Albano led the entire way. In a furious stretch-drive, Smith was able to guide the son of Harlan’s Holiday home ahead, finishing 1 1/16 miles on the dirt in a final time of 1:43.86. This marked the second career win and first stakes win for Intense Holiday, who now has a 7-2-0-1 overall record with a total bankroll of $351,900. “In the very beginning he kind of slipped leaving there; it kind of scared him and he got up into the bridle,” Hall of Fame jockey Mike Smith said. He went on to describe how he had to alternately steady and hustle the colt throughout the 1 1/16-mile event while weaving his way through the 14-horse field. “There’s a lot of room to improve and a lot of room to grow…we didn’t get to the bottom of him,” Smith added. So long as Intense Holiday and Wildcat Red stay healthy, 50 points will more than likely be enough to get them into the Kentucky Derby field of 20 on May 3, 2014. As stated earlier, Wildcat Red and General A Rod will both likely try for the March 29 Florida Derby. Both Intense Holiday and Albano will be pointed to the $1 Million Louisiana Derby (G1) also on March 29, according to an article from the Bloodhorse. 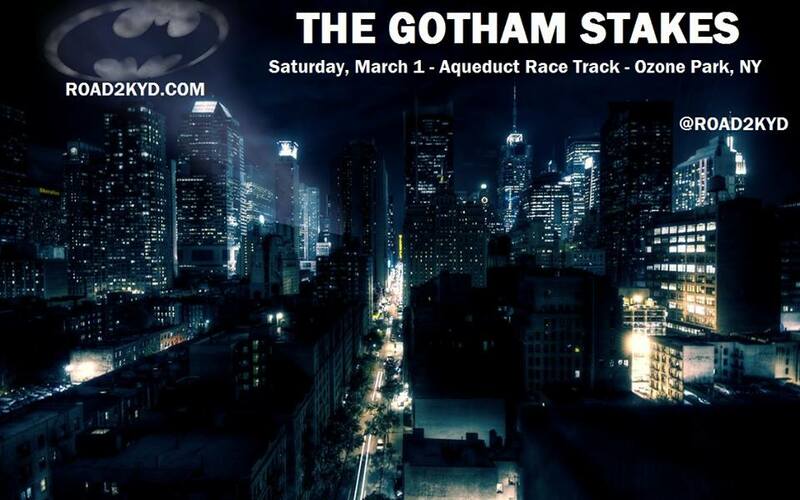 The next race of our Road to #KYD14 series is the Gotham Stakes on Saturday, March 1 at Aqueduct in Ozone Park, NY. This race is also worth 50-20-10-and-5 points to the top four finishers, so it should be another exciting weekend. 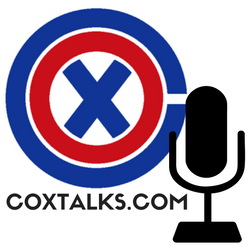 Stay tuned for more coverage!